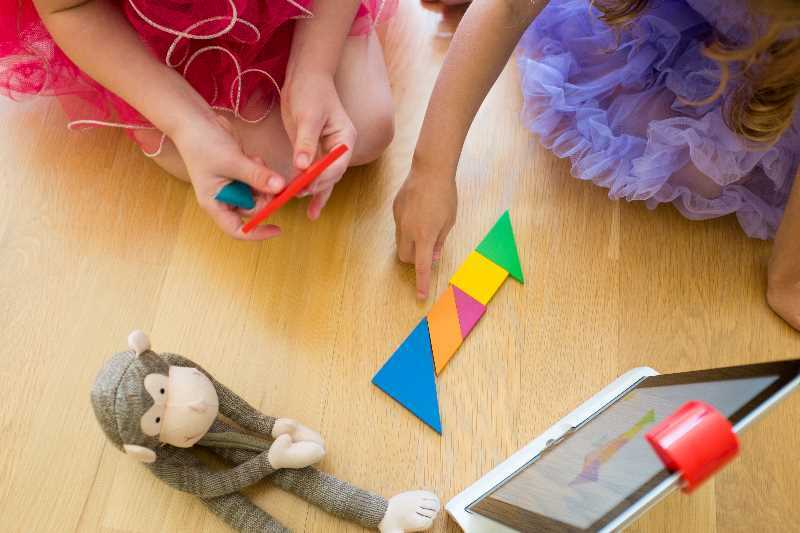 With Osmo attached to an iPad, the digital world that your kids can play in just got bigger! This innovative tech toy makes playing with 3D objects even more fun by adding involvement of the iPad. 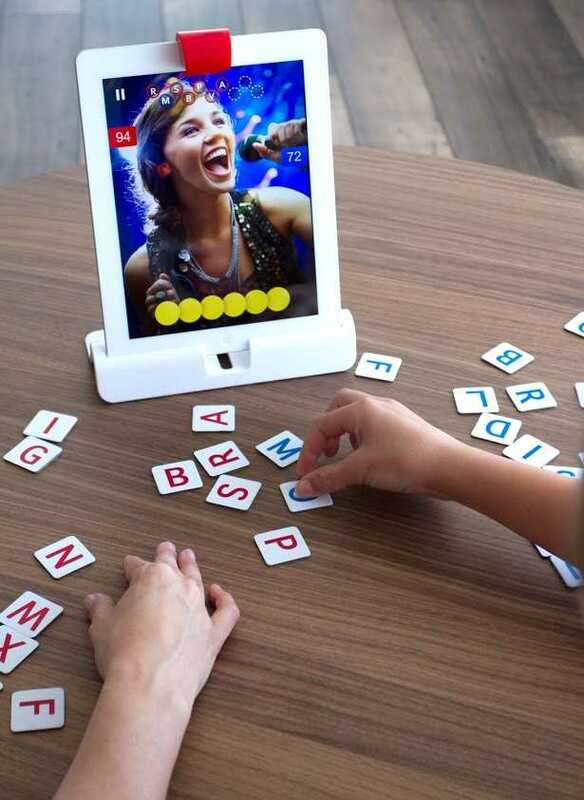 Osmo is an add-on to the iPad that enables kids ages 6 -12 to play with real toys in front of the device and then have the iPad incorporate these real world objects into the digital play. Osmo is a mirrored device that slips over the front-facing camera to redirect the sight area of the camera. It works in a similar manner to a toy periscope. 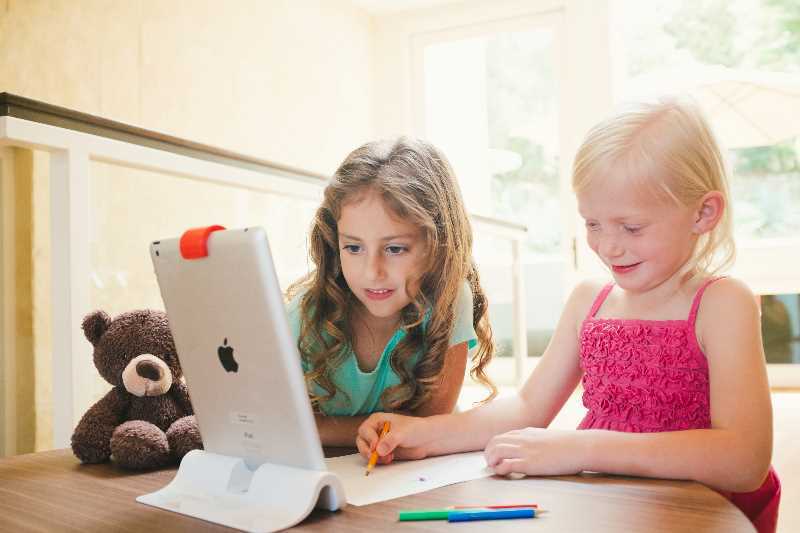 Osmo also comes with a base to hold the iPad in a vertical position, so that the camera sees an area focused directly in front of the iPad. It's bundled with a set of alphabet tiles and tangram blocks. Once Osmo is set up, kids can then play three different games. The games are downloadable for free in the iTunes app store and are called Newton for Osmo, Tangram for Osmo and Words for Osmo. With the Newton for Osmo app, kids work through a series of puzzles about controlling dropping balls that appear on the iPad screen. At first, your goal is to redirect the balls to hit targets. Kids maneuver the dropping balls by drawing Rube Goldberg-like solutions on paper placed directly in front of the iPad or by dragging real objects into the play area to create bumpers and ramps. 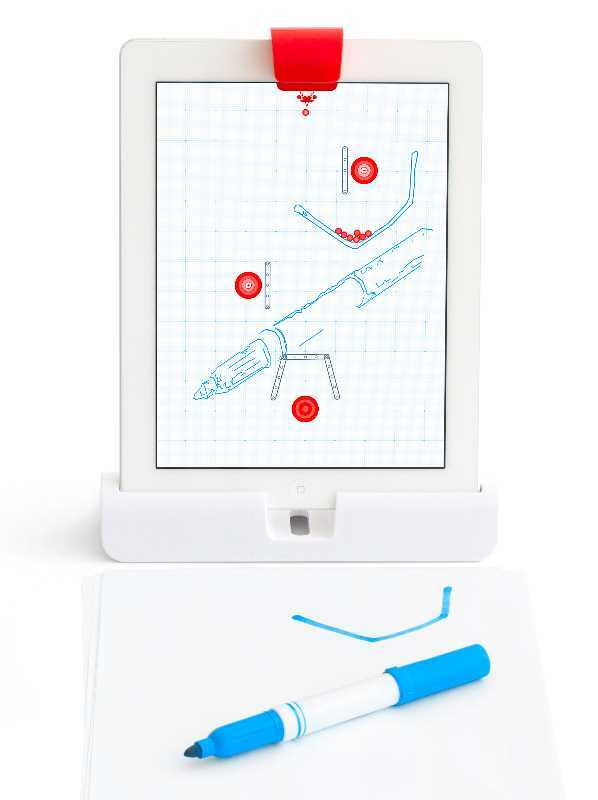 Using what the camera sees, Newton for Osmo superimposes the drawing or gathered objects into the game with the balls, so that the balls appear to bounce off of the objects appearing in front of the iPad. This game play is intriguing to kids. They will experiment with angles and ramps to reach the targets. As the 60 levels of puzzles increase in difficulty, kids get to explore accelerators, propellers, and teleporters. This game offers endless solutions to trigger your child's imagination. The Words for Osmo app is all about spelling words, using letter tiles. The tiles come in two colored sets; so that two children can play competitively or cooperatively. Kids play the game by looking at a vibrant image on the iPad and then spelling a word found in the photo, using the tiles. Osmo recognizes if a correct letter is placed in front of it. This app makes spelling words fun and exciting. Classic tangram puzzles involve placing seven geometric blocks in different configurations to create fun images, such as a cat or a seal. With the Tangram for Osmo app, kids match the outlines shown on the screen by placing the blocks in the correct formation in front of the iPad. Osmo tracks the position of the blocks, and lets kids know when a block is in the correct position by filling the outline with color. When kids successfully solve a puzzle, new ones become available. Each of the 600 puzzles can be tried in four levels of difficulty.